These designs were shown on Jewellery Maker on 8.7.14. Click here to see the show. This glittering statement necklace is made in sections and put together at the end. 1. Pyrite sections. For each section use 6 x 60 cm nylon cord and 2 x 70 cm 0.25 wire. Thread 46 grey pyrite onto both wires and braid using Round Braid, making sure that 1-2 cm of braid is left unbeaded at both ends. Repeat for the lilac section with 54 beads and the blue section with 62 beads. Finish the ends with ribbon ends and trim. 2. Braid section. Use an S-clasp as the starting point for the braid, making sure that it is tightly closed. Cut 8 x 1m lilac cord, 6 x 1m white cord and 2 x 1m blue cord. Thread through the S-clasp and centre the clasp. This makes 32 cords. Position the cords on the disk as shown, with two cords in each slot. Braid using Round Braid for 12-15 cm and finish off with end caps or wire. Repeat for the other side. Attach the clasp with jump rings. 3. Attach jump rings to the ribbon ends and pull them all through a wire cone (optional). Slide the three jump rings onto the S-hooks at either side. Pendant Necklace – Use a toggle clasp as the focal. 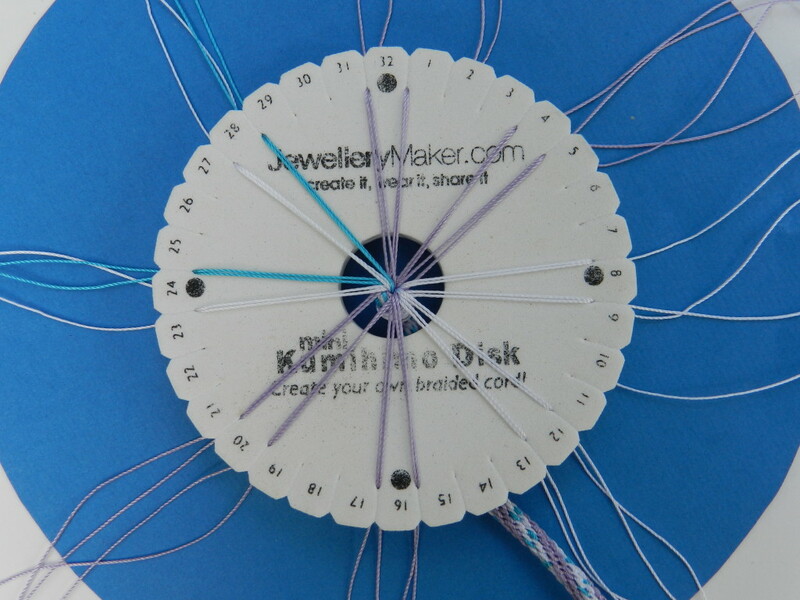 Use the ring on the clasp as the starting point for the kumihimo. Cut 2 x 75 cm white cord and 6 x 75 cm lilac cord. Centre the clasp and put 2 cords in each slot on either side of the dots. Braid using Half Round Braid instructions and finish with an end cap or wire. Attach a double length of chain to the other side. Make pyrite charms using headpins and attach them to varying lengths of chain and then to the toggle. 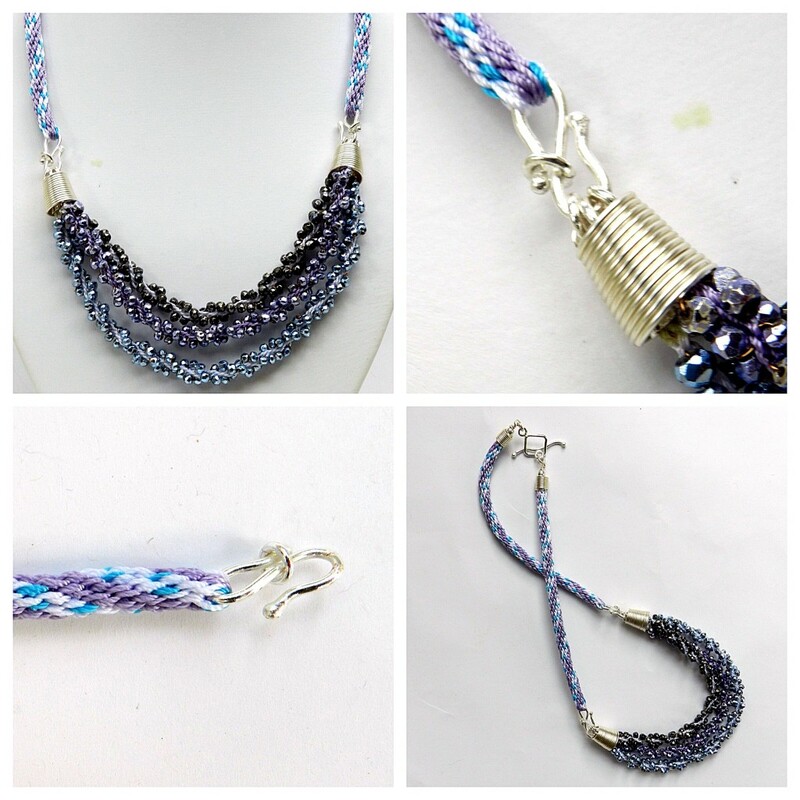 Bracelet – Make a 10 cord flat braid using two or three cords in each slot. Add a bead on either side every other row. This braid was demonstrated on 24.6.14. Earrings – Make a pyrite charm using a headpin. Thread 4 x 40cm cord through the wrapped loop and thread 2 beads onto each cord. Braid in the beads and 1cm further. Finish off with a bell cone and earring finding. Repeat.